The NYX Gaming Group is an industry leading software developer of premium casino games. Together with its Australian production partner, NextGen Gaming, there are over 300 online and mobile real money casino titles available at some of the biggest Internet casinos, with a special focus on bingo, lottery and video pokies. NYX Gaming (formerly known as NYXInteractive) was founded in 2006. Over the years the brand has grown to become a globally recognised software developer of casino platforms and bingo, poker, scratch card and lottery systems – particularly NYX Bingo, their award-winning platform for line bingo. The modern iteration of NYX Gaming was established in 2011 after the acquisition of NextGen Gaming, a privately-held company specialising in 3D online slots, and the creation of NYX Social. Since 2011, the company has rapidly expanded to produce an upgraded version of NYX Bingo and a new mobile gaming-centric system called NYX MOVE, which ports casino games from PC directly to mobile and tablet devices with all functionality and game-play quality intact. With widespread availability across a majority of the world’s leading online casinos, the NYX Gaming Group went on to receive the highly sought after title of RNG Casino Supplier of the Year at the 2013 eGR Casino Awards. Together with NextGen, NYX now has over 300+ high quality online casino games. The main company is commercially based in London, with the teams of NYX Interactive, NYX Social and NextGen based in Las Vegas, Stockholm and Sydney, respectively. Doctor Love on Vacation: A cheeky 5 reel, 20 pay-line slot carrying the theme of the amorous Dr. Love going on vacation to the tropics, this game is one of NYX’s stand-out titles for its comical tone, bright and vivid artwork and fantastic animations – alongside its generous scatter feature, which triggers 20 free games, and its wild symbols multiplying any win by six. 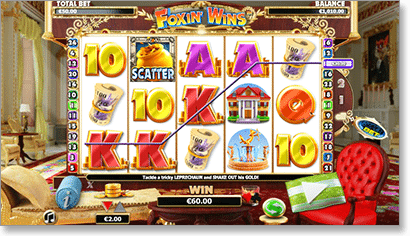 Foxin’ Wins: A 5 reel, 25 pay-line 3D online pokies game centered on an aristocratic anthropomorphic fox and his opulent home as he chases a cheeky leprechaun. This is one of NYX Gaming’s most popular original titles, and showcases the studio’s stunning 3D animation work and upbeat audio, with wonderfully unique character icons on the reels and scatter symbols bursting with colour. Two Random Bonus features – Foxy Funds and Leprechaun Shake Down – involve randomly awarded bonus cash and mini-games, respectively, spicing up the usual slots game-play into something unique. Merlin’s Millions: A 5 reel, 50 pay-line 3D slot, Merlin’s Millions is a joint creation between the teams at NYX and Next-Gen which is themed after the legendary magician known in Arthurian mythology. While its graphics and artwork are wonderfully true to its inspiration, its the ‘SuperBet’ feature unique to the game which is the reason for its popularity – an optional feature that lets players increase their Wild multipliers for the chance to win massive prizes. Where can I play NYX games? NYX Gaming titles are available to play for real money at SlotsMillion.com , one of our top recommended casino websites. Many of the best titles come from the team at NextGen Gaming in Sydney. For a full list of all NYX/NextGen games, go to SlotsMillion.com and use the search tool to filter by software provider by clicking on ‘NextGen’, where you’ll find the full list of 70+ titles. NYX Gaming’s line of titles are designed around Web-based no download game-play (otherwise called Instant Play) which means that you can play games instantly using your Safari, Chrome, Explorer or Firefox web browser without requiring any additional downloads. Game-play is of the highest quality, with life-like animations and epic audio scores adding to the interactive experience. For real money players who own multiple devices, NYX Gaming offerings can be played across computer, laptop, mobile phones, smartphones, and tablet devices – with the aesthetic and game-play quality identical, thanks to the solid work accomplished by the NYX MOVE division.